Built as an astronomical observatory in the 17th century, the Rundetaarn (Round Tower) is a must-see for anyone visiting Copenhagen. You enter on street level and spiral your way up nearly 150 feet on a gentle ramp. While it provides a great view of the surrounding city from the top, the inside design was what caught my eye. I stopped about halfway to the top to take this image. There was a small alcove behind me where I sat down and waited for the area to clear. I found the complexity of the design to be magnificent for something built in 1642. 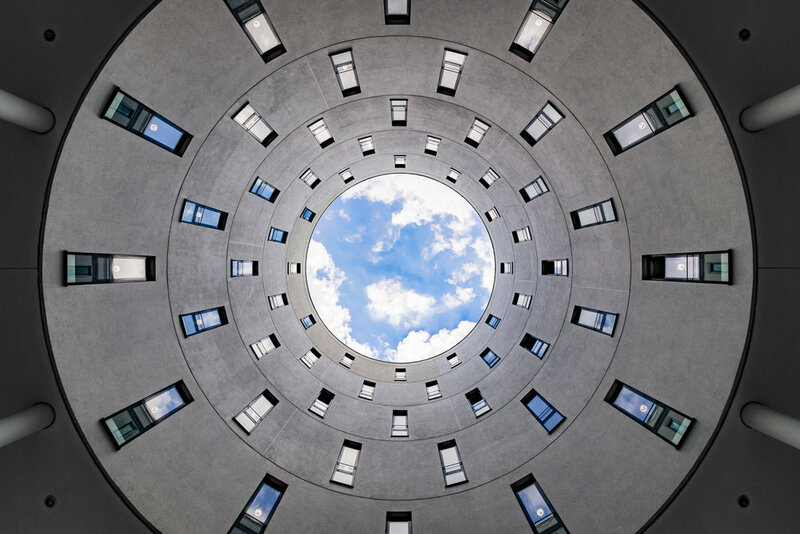 While the floor slowly spirals up, the ceiling does not just mirror the spiral. Instead, it features repeating triangular sections that catch the light and cast shadow from the surrounding windows. Beautiful shapes that, to me, resemble an eccentric cap & bells hat of a court jester. Visiting Monument Valley was one of many highlights from my trip to the Southwest U.S. It straddles the border of Arizona and Utah but is officially in the territory of the Navajo Nation. It has been featured in numerous films dating back to the earliest Westerns and is, perhaps, what most people think of when they imagine the American West. There is a scenic 16-mile dirt road that loops around and in-between the numerous sandstone buttes. One stop along this road is named Artist's Point, and it was my favorite place to watch the sunrise. The overlook faces northwest and is shadowed by a large mesa. While you cannot see the sun, it provides a perfect vantage point to watch the 1,000-foot tall rock formations light up. I went there expecting the red rocks to become saturated in the soft morning light. I did not anticipate having wispy clouds in the dry climate, but they were a welcome addition. As I stood there watching the light make its way to the valley floor, another surprise developed. Slowly, interesting patterns of light and shadow emerged as the sun touched the top of the small dunes in the foreground. This combination of elements provided a unique moment to capture. Lastly, an unforeseen benefit of this overlook is that it draws a relatively low number of visitors. I spent the entire morning here completely alone, allowing for an incredibly peaceful, monumental sunrise. This was an unexpected discovery during a visit to Vienna, Austria. We were traveling to our next destination via the Vienna U-Bahn, and upon exiting the train, found ourselves in this space-age underground station. The monochrome platform with its bright red accents was begging to be photographed, so we waited a short time for the station to empty and started capturing images. It was such a contrast from the ornate halls found in the Viennese palaces. Alone within the artless walls, it felt like we were transported deep within the Death Star. I could picture Darth Vader, flanked by Stormtroopers, descending the escalator in front of us. Lacking any blaster rifles to defend ourselves, we did not stay long...there were many more lavish palaces to be seen in this amazing city. 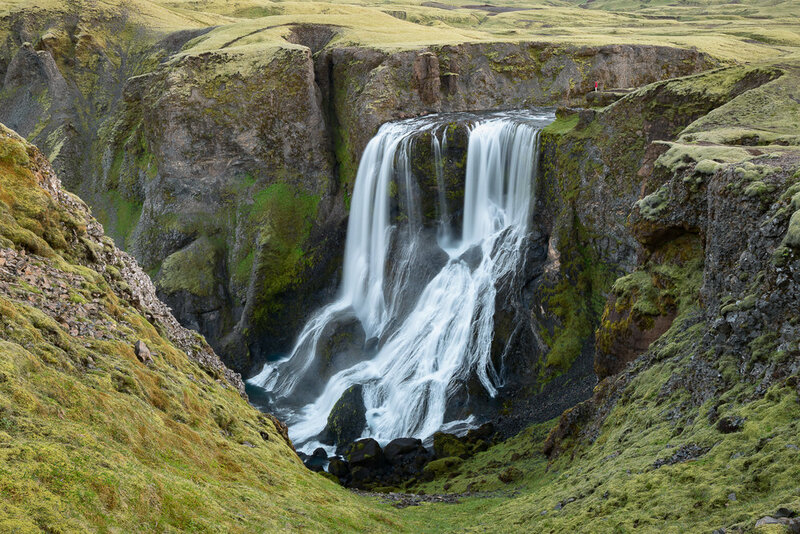 Iceland is full of beautiful waterfalls. By solely driving the coastal Ring Road, you will encounter waterfalls around almost every turn. As most of them are easily accessible, you can get a great sense of the beauty of Iceland without much effort. On my last visit, I decided to venture farther into the lesser traveled Highlands. I was hoping to experience parts of Iceland I had not seen on previous trips. Most of the roads here are passable only in the Summer and remain closed during the rest of the year. A 4x4 vehicle is required as the roads are rough and, depending on where you are going, you may have to drive through varying depths of water in order get to your destination. The reward can be spectacular scenery with very few tourists. One of my rewards was this waterfall, Fagrifoss. It is about a 90-minute drive from the ring road, winding up and across several waterways. Most of the streams were shallow and easy to navigate. The last one, however, was more challenging. At 15 meters wide and deep enough that I could not see the bottom, I was hesitant to cross. Only after seeing another (more experienced) driver make their way slowly to the other side, did I find the nerve to do it myself. I unquestionably felt a rush of adrenaline as my tires entered the water. Trying hard to maintain the same path as the previous driver, I successfully reached the other side. It was easier than expected and I was happy to be on my way to the waterfall. I spent the whole day hiking the area and appreciating the waterfall from various spots. I set up my camera on this hillside overlooking the falls. I like the shape of the canyon providing a natural frame to the composition. Still, there was something missing. I wanted the viewer to be able to comprehend the size of this remote waterfall. I realized the only thing that could give a sense of scale was me, so I decided to place myself in the scene. I set a timer on my camera and started the 200-meter walk across to the top of the canyon to the falls. I assumed the biggest challenge to photographing this place would be the journey to get here. However, midway through my hike across to the top of the waterfall, there was an incident that caught me by surprise...I heard a noise behind me. I was alone, I knew that. The last person that I had seen in the area left hours ago, and yet something was close by. I quickly turned to look, and what I saw struck more fear in me than navigating that last water crossing...four wild creatures staring back at me...a mother sheep and her three lambs! OK, granted, I was not scared of the sheep. What I was scared of was their proximity to my camera on a rather steep hillside. They were within inches of my tripod! I could easily see a curious lamb investigating the strange device, sending it crashing to the bottom of the canyon. Caught in such a precarious situation, I immediately turned back. Fortunately, the lambs were more interested in grazing than learning how to flip over a tripod. Luckily, they also quickly retreated higher up the hill once I approached, saving my camera from oblivion. Shaken by my encounter, I scanned the area for several minutes looking for more wild beasts. Confident the area was clear, I made another attempt. This time everything went as planned. Another successful crossing. Munich is full of traditional Bavarian architecture in and around its city center. However, once you travel further away from its core, you often find interesting modern structures. I walked past this office building one day and noticed sunlight illuminating the ground near the center of its footprint. I suspected there may be an an opening or atrium, so I decided to investigate. A few steps later I was looking up at the sky and wishing I had my camera. I made a note of the location and revisited it with my camera several days later. I chose a Sunday morning when the offices were closed to ensure I would not be a disruption. It was a beautiful day with white clouds and Bavarian blue skies. This was an added benefit, as the reflections in the windows added some color and contrast to the gray concrete. I wanted to capture as much of the opening as possible, but his proved to be a challenge even with my widest lens. The only option was to lay on my back and press the camera tight against my face. It involved a lot of scootching/sliding/repositioning to find the true center of the opening, but it was worth it in the end. This is a wall of blue shale rock that rises nearly 900 feet from the desert floor in central Utah. During the day it is far less vibrant as the sunlight mutes the colors. At dawn and dusk though, the cool tones shine through and create a striking scene next to the surrounding wastelands. The color near the top of the formation changes from blue to brown, with the very top section being orange sandstone. I mostly cropped these colors out of the image to focus on the blue ripples. However, I love the sparse orange boulders that have fallen from the top creating interesting subjects and color contrast. This is a panorama made from 5 images stitched together. I stood about 1 kilometer away from the wall and used a 150mm telephoto lens to zoom in and capture as much detail as possible. It is hard to describe the scale of this formation, but if you look closely, you can see me standing in the bottom center of the image. You may have to click on the image and view the larger version to see me more clearly. But trust me, I am there with arms outstretched…soon to be enveloped by the blue wave. This is Duvbo station in the Stockholm Tunnelbana system. Compared to Stockholm's bigger stations, it is simple and mostly monochromatic. The platform's red "Y" columns and overhead structure provide the only color in the station. The stripes on the floor are the only other design element and, overall, it is dark and featureless. I explored the station, but I did not find a reason to photograph it until I saw the next train arrive. The additional flash of light & color from Stockholm's blue trains made the scene much more interesting. As there was only a short wait between trains, I attempted to capture the scene with this extra element. I stayed here for about 20 minutes, snapping 3-second exposures of several trains arriving & leaving on each side of the platform. There was not a moment when two trains were in the station at the same time. However, with a simple blend of 2 images, I was able to place a moving train from different points in time on each side. Neist Point is one of the most picturesque lighthouses in Scotland. It is located on the northwest coast of the Isle of Skye and is a well-earned reward for those willing to make their way out to the remote stretch of shoreline. In addition to the walking path to the lighthouse, there are several paths in the area that take you up the surrounding bluffs. Great views are possible in all directions. This was my favorite spot, overlooking the entire peninsula and the lighthouse at the tip. I was fortunate this evening, as the steady rain that had plagued my four-day visit was just beginning to clear. It was still raining on the eastern side of the island, but the western side had a beautiful view of the sunset. It was delightful to finally see a colorful sky as the sun descended to my right. This image is a blend of two exposures. I intended to solely use one long 140-second exposure for the image to produce a soft sky and smooth water. However, the sheep on the hillside moved just enough in 140 seconds to turn into blurry white blobs. As a result, I also blended in a normal (sheep speed) exposure for the land. No, Strom is not a typo… :-) This was taken on a recent 14 hour layover in San Francisco. About 9 hours were spent sleeping, but I did manage to wander around the city center for a couple of hours and take a few photos. This was captured in the Nordstrom atrium in the Westfield San Francisco Centre. I didn’t actually do any shopping, but I did spend several minutes here gazing up at the beautiful design. It wasn’t very crowded, so I was able to take my time and try several compositions. This was my favorite position, standing in the center, looking up at the swirling Eye of the Strom. Over the past several years, Mesa Arch has become well known to photographers and tourists. Its reputation of being one of the best places in the area to catch the sunrise has spread and (on most mornings) dozens of people gather here with their cameras ready. If you get the proper conditions, the sun will light up the stone underneath the arch as it rises over the distant mountains, saturating the red rock and creating a glow beneath the arch. My first attempt, the day before, was a dud…the rising sun was blocked by clouds so there was no light or color. The second day was much better. I knew the area would get crowded close to sunrise, so I arrived early and set up in the dark before anyone else arrived. I had researched where the sun would rise, which made it easier to compose the scene and allowed me to set up off to the side, low to the ground, where I would have a good view underneath the arch. It is not the standard composition most people capture, but I liked the angles and the idea of getting something a little different. You cannot tell from this image, but there were probably 20-30 people to my left, all clicking away, doing there best to capture a good photo. It was a beautiful sunrise, but was fairly short-lived. Soon after I took this, the sun went behind the clouds and the light & color faded, but I was happy to have captured the moment. However, composing a vertical composition while looking horizontally at my camera’s 45 degree LDC tilt-screen was challenging. It involved a lot of hand/arm/feet repositioning and trial & error before I had what I felt was a suitable image. Standing at the bottom of spiral staircases and shooting upward is much easier. I did that here also, but the view from the bottom is not near as cool as this view from the top. Even if you are not familiar with the name Antelope Canyon, I suspect most of you have seen photographs taken here. Over the past several years, it has been one of the most popular photo destinations in the Southwest U.S.A.
Antelope Canyon is made up of two separate slot canyons, the “Upper” & the “Lower. Both are located on Navajo land and are accessible only by guided tours. This image was taken in the narrow & twisting Lower Antelope Canyon. Over the years, the soft sandstone has been eroded by flash floods, sculpting unique rock formations that flow and curve in various shapes and forms. The colors you see in the sandstone change dramatically as light enters the canyon and bounces off of the various surfaces. Mostly it is orange, but yellows, reds and purples are commonly seen, many times in the same area. It is definitely worth a visit if you are near Page, Arizona. Pick a sunny day (most are here), get your ticket in advance, and of course, bring your camera. This image was taken in the main administrative building of the city of Antwerp, known as “The Bell Tower.” There is not an actual bell to be found inside the tower (at least, I could not find one), but there is an amazing spiral staircase that stretches 14 stories. Being a public building, it is open to visitors and easy to reach the staircase behind the main lobby. The staff in the reception area told me it was no problem to take some photos of the staircase, so I walked up to the top and took images at several different angles…looking up, down and this one, straight on. As you know by now, I am drawn to how various shapes and lines interplay in photography. From this perspective, you find squares, diamonds, triangles, circles, repeating patterns, symmetry…and, of course the helix. All this variety, and yet I found it to be rather simple and pleasing. I later learned that the building derived its name from its previous owner, Bell Laboratories…so perhaps there is not an actual bell to be found here after all. Astrophotography is something that I have become very excited about over the past 2 years. My recent trip to Zermatt was planned specifically to take advantage of the dark skies in this area. I had researched the position of the Milky Way in relation to the Matterhorn and coordinated my arrival during a time when there would not be a moon in the night sky. In addition, I booked a room in a mountain hut near Stellisee. The lake is about 10km away from Zermatt and 1,000 meters higher in elevation, where there is very little light pollution. All I needed was for the weather forecast calling for clear skies to be correct…and fortunately it was. In fact, the sky was perfectly clear. I do not think I have ever seen so many stars…they were everywhere! I was thoroughly entertained for about 2 hours, watching the Milky Way slowly move across the sky from left to right, getting closer to the Matterhorn every few minutes. I captured this image just before the galactic center started to fade down and away behind the mountains. Even in this environment you still find some light pollution. The lights from Zermatt below as well as lights from the Italian side of the Matterhorn were enough to illuminate up the lower part of the sky. I think this actually worked to my advantage though, as you can more clearly see the silhouette of the Matterhorn and the surrounding peaks. The Matterhorn is massive and normally dominates the skyline as you walk/hike around the area. However, in comparison to a galaxy of over 25o billion stars towering overhead…it appears much smaller. It was an amazing night and after getting a few hours of sleep (only a few), I was back at this same location to capture the sunrise image I shared a few weeks ago - Candlelit. This is another image taken in the Toledo Metro Station in Naples, Italy. Earlier this year, I featured an image of the escalator banks at the far end of this hallway - In an Octopus’s Garden. The passageway features various shades of blue and continues the water theme with light panels of ocean waves. In my opinion, the best feature is the light fixture above. To me, it resembles the USS Enterprise just as it enters warp drive. During my visit to Arches National Park, the park was temporarily closed from before sunset to after sunrise. I had hoped to spend a couple of mornings and evenings photographing the unique rock formations found here, but this was not possible due to a construction project on the main road. I rarely shoot landscape images in the middle of the day. Usually at this time, the light is too harsh. Often colors also get washed out and/or dark shadows distract from the scene. As a result, I was not expecting to get any compelling photographs during my time inside the park. I was a little disappointed, but I knew the hiking and scenery would still be fantastic, so I spent a couple of days exploring the park. For the most part, I was correct. The hiking and scenery were great, but the light was harsh and photos just would not capture the beauty of the place. However, the day I hiked up to Delicate Arch (perhaps the most famous natural arch in the park) I found the scene to be very photogenic. A thin cloud to the left softened the sun just enough and I found the color contrast of the blue sky and red rocks to be beautiful. Of course it also helps to have the impressive Delicate Arch in the scene…seeing it in person is well worth the hike. Fortunately the shadow of the arch also cooperated, as from this angle you hardly notice it stretching away into the natural amphitheater below. A few weeks ago I applied for permission to photograph the Stuttgart Library. It is a beautiful, modern structure that I have been wanting to photograph for some time. As a result, I was excited when they granted me permission to photograph the library for 2 hours. They also granted me permission to use a tripod, which is normally prohibited. This proved essential, as the structure is filled with right angles and lines that would be very difficult to capture hand-held without distortion. I have several images from this day that I will share in the coming weeks. If you ever get a chance to visit Stuttgart, I highly recommend you spend some time here. Visiting Zermatt and seeing the Matterhorn have been on my wish list since we moved to Switzerland. A couple of weeks ago, I finally had the opportunity to go and spend a few days. My main goal was to photograph the Matterhorn, so I did not spend much time in town. Instead, I took a couple of lifts and hiked a short distance to stay in a mountain lodge near lake Stellisee. During the day, I walked several of the trails around the area, but in the morning & night I spent most of my time here at Stellisee, gazing at the iconic mountain. I thought I would share another image from the Liège-Guillemins train station. Descending from the train platform into the main lobby are several staircases such as this. It reminded me of a skeleton key as I reached this point, halfway down. Similar to the exterior facade, the architect uses rib-like features on both sides and if you look at the floor, you can see the reflection of the ribbed ceiling below. I recently spent several days driving through Belgium and the Netherlands in an effort to photograph some places that I had not seen before. My first stop was the Liège-Guillemins train station in Liège…not because I was catching a train, but because it is a magnificent structure. The station was renovated in 2009 with a modern steel, glass and concrete facade designed by the architect Santiago Calatrava. I wandered the station for a couple of hours and ended up taking many more photos than I expected. The arches, ribs, lines and curves allow for an almost endless number of compositions. In addition, the shadows were lengthening as the sun was going down and the station seemed to change every few minutes. As the blue hour arrived, the lights transformed the station yet again. Many elements that were cast in shadow a few minutes ago were now illuminated and vice versa…such a clever design. This image was taken on one side of the upper platform, looking towards the center. It is a bit hard to describe how the structure changes with the light…photos do a better job. As a result, I hope to share several more images taken here in the coming weeks. Lastly, I shared an image several weeks ago of the Transportation Hub at the World Trade Center. As it turns out, Calatrava was also the architect for this station. You can view The Hub image here and see some of the similarities in Calatrava’s designs.